The Regulatory Reform (Fire Safety) Order 2005 ensures that all employees are safe in their place of work. However, thousands of businesses breach this legislation by wedging fire doors open. Moving from one office to another with arms full of files or boxes can be cumbersome when you have to open a heavy fire door along the route. Wedging fire doors open is a breach of the legislation, it is dangerous and could lead to the employer being prosecuted, fined or even imprisoned. However, this illegal practice is common within offices and other places of work. Supermarket giant, Tesco, were prosecuted and fined £95,000 and ordered to pay costs of £24,321 due to fire doors being wedged open and failure to keep escape routes clear*. 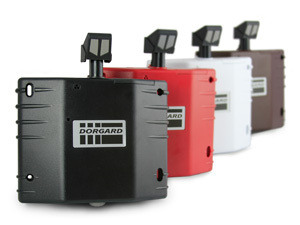 The solution is a device called Dorgard that once fitted to your fire door, will hold the door open legally, allowing free access to all areas of your place of work, without compromising fire safety. It is a battery powered unit that ‘listens’ for the fire alarm. 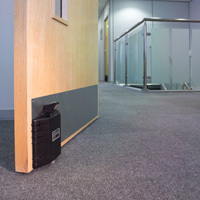 On hearing it, the Dorgard releases the fire door and allows it to close automatically. In the UK over 500,000 Dorgards have already been fitted and are helping to protect lives.